Camping trips and picnics just got more fun, thanks to the Weber Q 1000 portable grill. High end quality and superior construction allow the Q 1000 to meet the needs of small spaces while still maintaining its consistent performance reputation. Some assembly required. The KitchenAid Cart-Style Charcoal Grill in Black offers 804.3 sq. inch of cooking space spread across its upper-level warming rack and main-platform grilling deck. Features include heavy-duty cast iron cooking grates that are matte finish porcelain-coated so pre-seasoning is not required. Adjustable charcoal tray, ventilation, damper plus front-access door to charcoal make it easy to control cooking temperatures, which are easily monitored via the built-in heat gauge. Collapsible side tables allow its footprint to shrink when it's not being used and the wheels make it easily portable. A convenient slide-out ash drawer makes cleanup a breeze. This Nexgrill 4-Burner Propane Gas Grill in red boasts 644 sq. inch of total cooking space with 4 main burners and 1 side burner, supplying 60,000 BTUs of flame-roasting energy. The main grill deck is equipped with stainless steel-wrapped cooking grids featuring 7 mm crossbars, under which lies the Even-Heat Cooking System that distributes uniform heat throughout the firebox. Angled flame tamers deflect heat, prevent flare-ups and transform drippings into flavor vapors that infuse foods with a distinctive smoky taste. An electric ignition allows it to fire up instantly and an upper-level warming rack provides a place to heat buns and keep foods toasty. Casters make it easily portable and the built-in thermometer enables precise temperature regulation. 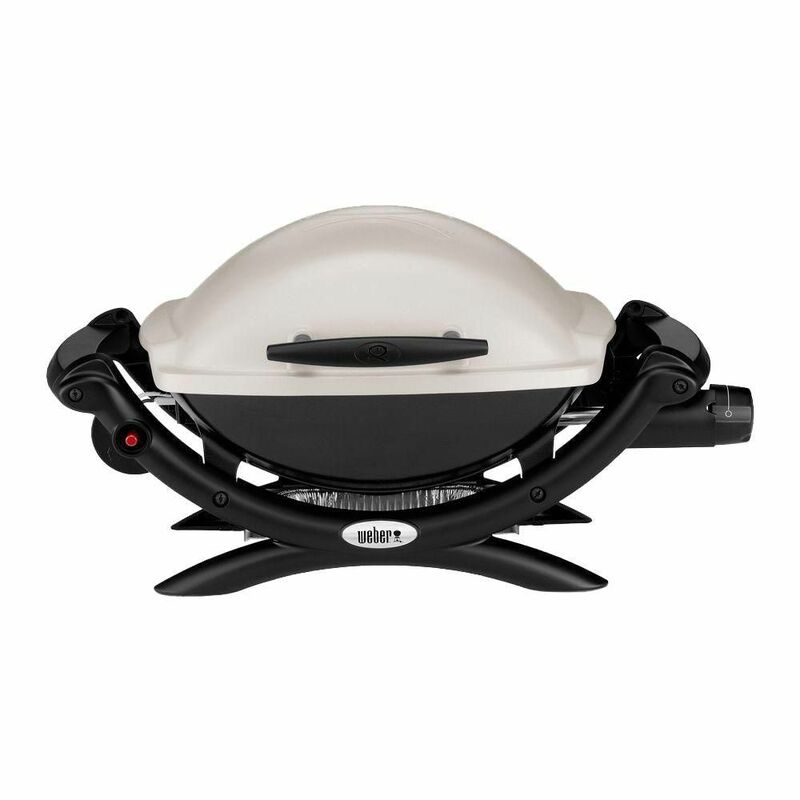 This 6 burner grill features a total of 75,000 BTU performances for cooking up to 50 hamburgers. 6 stainless steel burners with angled flame tamers and enhanced grates work together to distribute consistent heat across the entire grill surface and reduce flare-ups. The unique cart design enables to fold up the cart in minutes and eases for transportation and storage. The Weber Genesis<sup></sup> E-310 Grill offers three stainless steel burners with 38,000 BTUs of grilling power. Barbecue delicious feasts on the porcelain-enamelled, cast-iron cooking grates that are easy to clean and provide you with 507 square inches of primary cooking space. Q 1000 Portable Liquid Propane BBQ in Titanium Camping trips and picnics just got more fun, thanks to the Weber Q 1000 portable grill. High end quality and superior construction allow the Q 1000 to meet the needs of small spaces while still maintaining its consistent performance reputation. Some assembly required. Q 1000 Portable Liquid Propane BBQ in Titanium is rated 4.7 out of 5 by 243. Rated 5 out of 5 by Del from Great portable grill we use in our RV. Weber does a great product. Have the Large Weber on my pat... Great portable grill we use in our RV. Weber does a great product. Have the Large Weber on my patio at home. same great quality. Both get lots of use.. Rated 4 out of 5 by Josie 123 from Easy set up! I think it cooks meat and vegetables perfectly and the I like the cast iron grills. The BBQ and grills are also easy to clean. Rated 5 out of 5 by JeanR from Built to last Bought my Q Baby as it was called in 2004, original igniter has never failed. I have bought some replacement parts but have never spent much. This the only small grill I recommend to my friends. Rated 5 out of 5 by Jeff123 from Awesome little grill Bought this grill a year ago and used it extensively at the lake. It’s small which I needed but it fed a family of 5 doing meat alone on it. Heats up fast and cooks even and hardly uses propane. When this one stops working I’ll upgrade it to the electric start with a temp gauge in the same size. The ignighter never skipped a beat and even in windy conditions this little grill had no problems keeping a solid temp without the burner blowing out. Very easy to clean I would give this grill 10 stars if I could and would recommend to anyone looking for a small portable grill. Rated 5 out of 5 by Thuqmin from Great product. First ever Weber grill, love it. No flare ups, can leave unattended without worry. Impressive product, would definitely purchase again. Rated 3 out of 5 by Topcat 47 from good quality material but bad ergonomics After purchase of this weber 1000 model propane grill, I'm pleased with the quality of materials used in making this product.However the ergonomics of E:G: the placement of the regulator make it uncomfortable to use the handles to lift or carry the unit. Hi! Our Q 1000 series measures 27&quot; W x 16.5&quot; D x 14.5&quot; H with the lid closed and 27&quot; W x 20.5&quot; D x 23.5&quot; H with the lid open. Thanks! Can this BBQ be used with a standard 20lb propane tank? Hi! Yes, you can use this model with a standard 20 lb tank via Weber adapter hose # 6501. Thanks!